Make sure that the following options for each feed source accommodate the number of items you wish to import. This is the number of feed items to be fetched for each import. It can be set on a global level from the general plugin settings, or individually for each feed source. If left blank, it is ignored. Using zero works differently across browsers and it is recommended not to use zero in this field. This option tells the plugin which feed sources can import, and which cannot. If set to Active, then the feed source can import feed items. 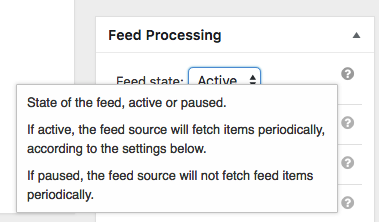 If set to Paused, then no feed items will be imported from this source. 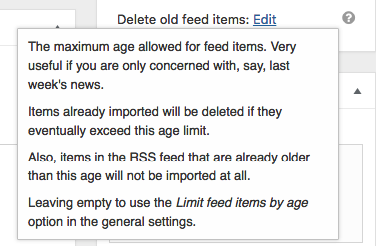 This limit option will automatically delete feed items that become older than the pre-set age. Furthermore, if a feed item is being imported and is already older than this age, then it is not imported. Thus, make sure that the feed items you are trying to import are more recent than the age set in this option.